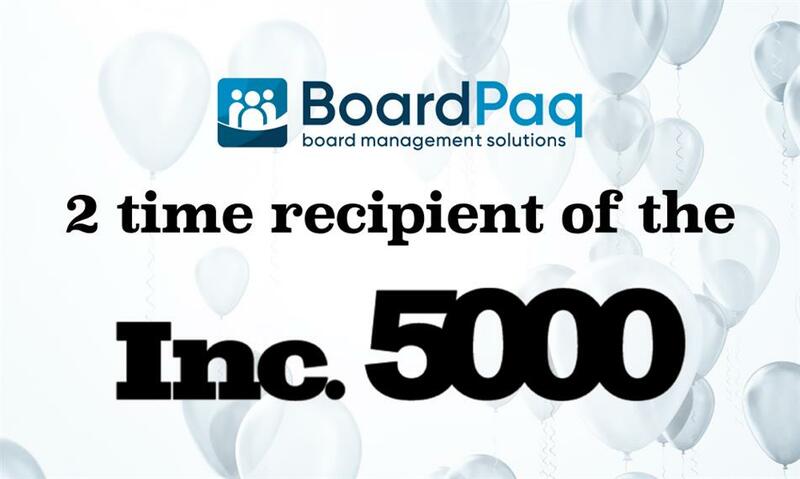 BoardPaq, the board portal of choice for more than 1,200 organizations, is proud to announce its inclusion on the prestigious Inc. 5000 list for the second year in a row. The six-year-old company provides the most robust and innovative board portal available to a variety of cost-conscious organizations, including community banks, credit unions, nonprofits, rural electric cooperatives, school boards, municipalities, trade associations, and many others. The past few years have seen BoardPaq achieve several milestones, including the release of multiple new features, onboarding its 1,200th customer, being named one of the 25 fastest growing privately held companies headquartered in the St. Louis metropolitan region for the past two years, and now being named to the Inc. 5000 in 2017 and 2018. As the number of applicants grows to tens of thousands, it gets harder to make the list each year. Only a fraction have made the Inc. 5000 more than once, “a mere one in three to be exact”. If you serve on or work for a board of directors, BoardPaq would love to add you to a growing list of organizations that have made the company their board portal of choice.